Call Kari at (610) 488-8978 for more information. Discover NATURAL HORSEMANSHIP techniques to solve training problems encountered by DRESSAGE, EVENT, and HUNTER/JUMPER riders. NOTE: the horses being used for the demonstrations are truly green or have a very real training problem. Nothing will be done with these horses prior to the demonstrations to fix any of their issues. At each demonstration, exercises will be demonstrated that will FIX the problem. The problem may have to be fixed in stages and/or the exercise may take more time to teach thoroughly to the horse than is possible during the demonstration. This training will be done before the next symposium and the horse's progress will be demonstrated at the next symposium. Audience members are encouraged to ask questions and request help for their horse's specific problems. 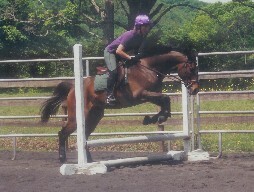 LET'S SHORTEN THE TRAINING TIME AND BE SAFE WHILE HAVING FUN DOING DRESSAGE AND/OR JUMPING!